After News Of India’s Fake F-16 Claims Busted By USA, Indians Are Bashing Modi For Lying And It Is So Awkward! There has been a lot of twists and surprises in the current Indo-Pak situation that has been going on for a while now. And the most recent development in this scenario has raised a lot of questions in the minds of the Indian people. Indian government made huge claims of finishing over 300 “atankwaadis” and bringing down a Pakistani F-16 and destroying it. These claims were baseless and made without any concrete evidence and Indians are realizing this now. US denies any Pakistan Air Force F-16 being party to February 27! Pakistan invited US officials to actually physically count the number of F-16s after the incident. And to the Indians’ surprise and to Pakistan’s “told you so”, all F-16s that Pakistan ever had were present. This actually puts Modi sarkar to shame and Indian people really need to question their government for feeding them lies in the name of patriotism. Sorry Abhinandan the only plane that went down that day, was yours. Oops. This is some bad news for the movie. 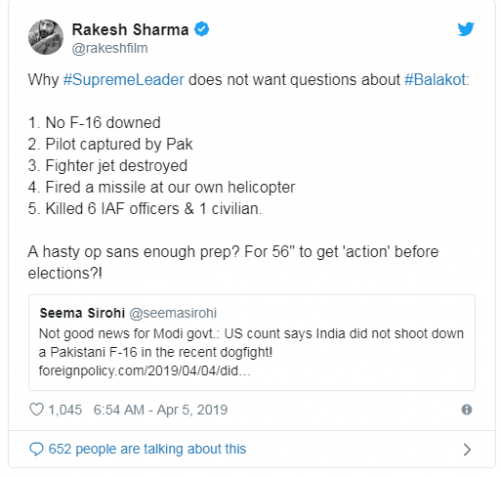 So now that the truth is universally out, what are they going to show in the Bollywood movie they will be making about Abhinandan and the whole Balakot incident? They really have been glorifying their caught Indian pilot and the “josh” really had been high. But what now? 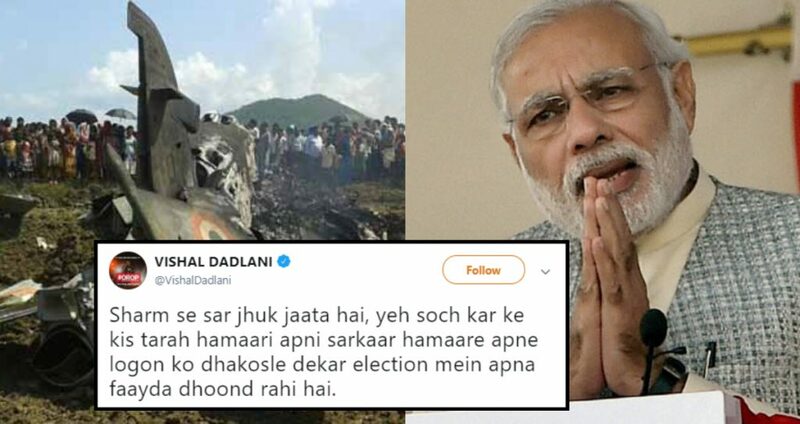 All the claims of downing a Pakistani plane have gone down the drain and people in India are now actually asking questions to Modi government, and rightly so. The reason why Indian government wants no questions on this incident. The reason why Modi is not answering any questions regarding this incident or giving any proofs is simply that he can’t. How can he tell everyone the truth and reveal incompetence of the Indian Air Force and his own government? And this reveal of ALL Pakistan Air Force’s F-16 came out at a very bad time right before the elections and this can have a huge effect on the results and definitely won’t favor him. So the thing is that Modi government is all talks and no proofs. The best part about is that his own people are now turning up against him. Our boy Vishal Dadlani really went off with this tweet. It’s ok Vishal welcome to this side of the truth. It’s not only that Pakistan has all its F-16s intact, wo 200-300 atankwadi wali khabar bhi jhooti thi. Pakistan has BEEN saying but oh well, baat tou suntay phir Amreeka ki he ho. Sharm se sar jhuk jaata hai, yeh soch kar ke kis tarah hamaari apni sarkaar hamaare apne logon ko dhakosle dekar election mein apna faayda dhoond rahi hai.